Do you teach your kids good dental hygiene? Hi again and happy weekend for all of you! I get most of the times question from parents on how they can teach good dental hygiene to their kinds. It seems that they have a little trouble getting their kids to brush their little teeth every day and such. It is understandable as kids are really hyperactive and tend to take everything like a game. Anyways, hopefully today after this article everything is going to change for good. Getting down the basics for a good dental care routine is really important. Especially when we are young. Taking good care of our teeth as soon as possible is a key factor that determines beautiful white teeth in the future. It is very logical to think that this actions makes dental hygiene a lot easier and prevent a lot of dental diseases in the long run. By having a proper dental hygiene we can avoid suffering nasty diseases like ca ries or gingivitis. As parents, we have the duty to prepare our kids to face responsibilities like taking good care of our bodies and health. This include our teeth and gums, so let’s jump right into the tips! Starting with the most basic of advices in good dental hygiene it is brushing. We have to start by teaching our kids to get the best dental brush, and that is a soft bristle brush. After that it is a good idea to brush side by side to guide them on what is the best technique they can use. Using gentle strokes and going vertically and horizontally is more than enough to keep those teeth clean and white as pearl. To keep their teeth more healthy you can teach them how to use dental floss and mouthwash. That will depend on their age. If they already have their permanent teeth then it is a good idea to start teaching them how to use those items. It is important to create the habit to clean their teeth at least two times a day, especially after every meal. Going to the dentist at least twice a year is important to keep a good dental health. The thing with kids is that they tend to be really afraid of dentists. Just seeing their tools or hearing the drills is enough to make them scream and hide. It is important to make them understand that dentists are not dangerous at all. In fact, we have to teach them that dentists are good friends and that they are necessary if we want a white beautiful smile. Speaking of dentists and good friends, maybe you should consider taking your kids to Los Algodones. Here at Dental Solutions in Los Algodones Mexico we have excellent prices and a dedicated staff fluent in English to attend adults and kids. You can save up to 70% in dental treatment compared to the prices in the US and Canada. 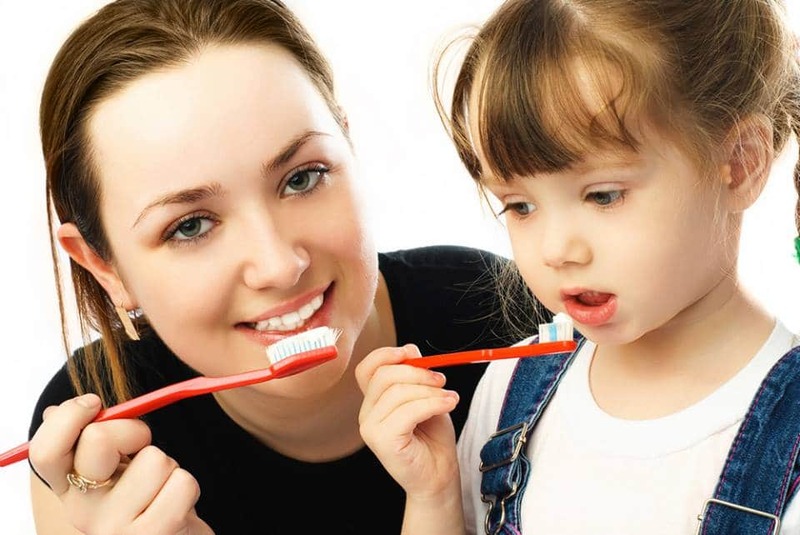 To teach your good dental hygiene, setting an example is one of the best courses of action. If they see you brushing, flossing and such they will pick up the behavior and imitate you. Apart form this it is pretty important to talk them about a good diet. Kids loves candies but they can be really bad for their teeth. It is the same with sodas, they can be particularly rough with their precious smile. Instead, teaching them about the value of vegetables and fruits can make a world of difference in their teeth and health. Drinking milk also is really good for teeth due to calcium, so making them drink a glass daily certainly helps a lot too.